It was 2014. 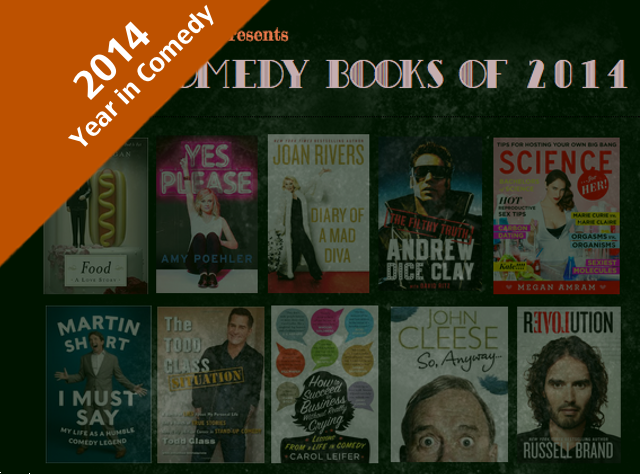 The Greatest Year in Comedy since the Beginning of Comedy had great stand up, great movies, great shows, and it also had great books. These ten comedians wrote ten books while they were killing it in their respective comedy arenas. Some of the books were biographical, others were political or just damn funny, and they were all excellent. Now we need you to vote, on who had the #1 book. Jim Gaffigan, Amy Poehler, Joan Rivers, Andrew Dice Clay, Russell Brand, Carol Leifer, Todd Glass, Megan Amram, John Cleese, or Martin Short. Food: A Love Story by Jim Gaffigan: Gaffigan takes his favorite thing in the world and transfers it from his stand up act to hardcover: food. Gaffigan expounds on food in every way you can imagine, from his favorite types, to how food makes him feel. Gaffigan is one of the funniest comedians working today and even admits to being a little fat, making this a sure fire trip to his second best seller. Yes Please by Amy Poehler: Amy Poehler’s first book takes you through her life and career through a series of lists, stories, and poetry in ways that only Poehler can. Poehler has help from Seth Meyers, her parents, and the reader in writing her hilarious memoirs. Diary Of A Mad Diva by Joan Rivers: In her final book, Rivers pens a diary given to her by her daughter Melissa and records her daily thoughts, and no one is safe from her cross hairs. The book takes shots at over 130 celebrities in a variety of ways, including actress Kristen Stewart, who reportedly threatened Rivers with a lawsuit over comments made in the book before it was even released. A must read for fans of Rivers, who proves she was funny right up until the end. The Filthy Truth by Andrew Dice Clay: Comedian Andrew Dice Clay shows his life behind the ‘DICE’ character by taking readers behind the curtain as he describes his early life, pursuit of fame, and his portrayal in the media. Fans of Dice will love how much he opens up about aspects of his career that he wishes would have gone differently and how he ultimately got it back on track. Revolution by Russell Brand: Russell Brand’s second book is a huge departure from his first attempt and books by comedians in general as he breaks down what’s really wrong with the world, our government and culture. Brand doesn’t waste his time taking on easy targets and instead blatantly tells readers that they are being lied to all the time and what they can do about it. Brand doesn’t shy away from taking on politicians and even calls for people not to vote in what could be the start of a revolution. Definitely a must read whether you agree with Brand or not. How to Succeed in Business Without Really Crying Hardcover by Carol Leifer: Carol Leifer’s second book is one of the years best and a great read for aspiring comedians and fans of comedy in general. Leifer gives hilarious, real world advice that anyone can use while reminding readers to take care of themselves in whatever way that they can because it will pay off in the end. Just looking at the cover tells you how much respect Leifer has garnered over the years as an all-star line up of comics praise her and the virtues of this book. The Todd Glass Situation by Todd Glass: ‘The Todd Glass Situation’ is much more than a literary version of the comedians much talked about coming out. It’s also an honest take on language, treating others with respect and everything else that’s on Glass’ mind. The book weaves deeply personal stories with hilarious tales from different times in his long career. Glass has been a ‘comedians comedian’ and this book should be read by every fan of Glass and all fans of comedy in all its forms. Science…For Her! Megan Amram: Megan Amram has gone from Twitter comedian to TV writer to a full fledged author with the release of her debut book ‘Science…For Her!’. Amram hilariously breaks down the underlying sexism found within women’s magazines by writing her own satirical ladies journal that focuses on science and her personal life with a series of essays, quizzes and illustrations that make ‘Science…For Her!’ one of the most original books of 2014. So Anyway by John Cleese: John Cleese’s memoir gives readers exactly what they want. Cleese takes readers through his illustrious film career and his iconic role in the Monty Python comedy troupe. Cleese spills on the origins of some of the troupe’s most famous sketches as well as his interesting journey during the height of British comedy. A great read for fans of Cleese, and Monty Python. I Must Say: My Life As a Humble Comedy Legend by Martin Short: If anyone should write a memoir about their career in comedy, it’s Martin Short. He’s been a part of comedy institutions like ‘SCTV’ & ‘SNL’ and has had a storied film career. Short’s memoir is worth reading just for his take on those times. But Short has also experienced great tragedy in his life, something he doesn’t shy away from in the book, making it one of the best reads for a look inside the ins and outs of what its like to be Martin Short.